Almost 46 million people are enslaved around the world today. But we’re in the middle of history’s fourth great antislavery movement. We have a global commitment to ending slavery by 2030, as part of the Sustainable Development Goals, and a deep commitment from the UK government, in the new Modern Slavery Act. 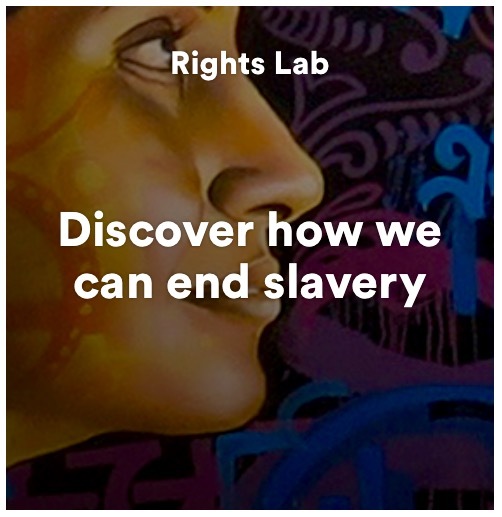 We’re able to do this because, firstly, we’re home to the world’s leading modern slavery experts, including Professor Kevin Bales, CMG, whose work on slavery was named one of the top “World-Changing Discoveries” by the Association of British Universities. Secondly, we have comprehensive disciplinary breath: a team of over 100 people, across 16 teams, from all five of the university’s faculties. This means we can work to map slavery from space with satellites; understand slavery’s economics and its relationships to migration and armed conflict; design slavery-free supply chains; and make Nottingham a slavery-free city then roll out that local model nationally, to mention just a few of our transdisciplinary projects. And thirdly, we can build this platform because of our approach to partnership and co-design. Our work is shaped at every stage by survivors of slavery, several of whom are on our team, and we work closely with our NGO partners. How many slaves are there and where are they? What works to tackle it? What difference does freedom make? This last question is key. We’re demonstrating the global benefits of ending slavery, for economies, peace, health, and the environment. If slavery is a drag on human and economic development, then we want to show that ending slavery will mean a better world for everyone: safer, greener, more prosperous, more equal. This what we call the Freedom Dividend. We want to help end slavery and achieve this Freedom Dividend by 2030—and we believe that if there was ever a tipping-point, when we might tip slavery over the brink into its own extinction, it is now. And so, taking up Jesse Boot’s 1928 vision of a university committed to “the welfare of our fellow citizens,” this means Nottingham is trying to help construct a real watershed for humanity: a moment when the world finally rejects the great lie of history, that some people are sub-human, and embraces instead the great antislavery truth—that labour should not be forced, and that people are not for sale. Professor Zoe Trodd is Director of the Rights Lab, a University of Nottingham Beacon of Excellence. The University’s six Beacons champion its responses to global challenges and are at the heart of its landmark £200m investment in research over the next five years. One would think slavery is history but unfortunately, no. It has become the proverbial hydra-headed monster. living with us, staring us in the face everywhere we turn to and threatening to consume us.This is a very important project at a time when millions of people need to be rescued from the monster which had ever held humanity by the balls. I have read Trodd et al’s Modern Slavery… it is a must read to understand the basic facts of modern slavery. The present Project which has even got a laboratory is laudable indeed. I call it ”A redemptive project to call back a human race on the brink of annihilating itself” Kudos to Prof. Trodd and her team.